While liberals search tirelessly for blood in the water, conservatives are in shock. National Security Advisor, Michael Flynn has turned in his resignation. The Daily Caller has reported that his resignation was sent by written letter, this amid accusations that he misled Vice President Mike Pence regarding a call he had with the Russian ambassador. Reportedly, in that conversation he had discussed sanctions levied against Moscow. Pence put his neck out for Flynn and released a statement to the press that the now former national security adviser had not spoken to Russian ambassador Sergey Kislayak. But reportedly, a U.S. official told CNN Friday that Flynn had in fact spoken to Kislyak about sanctions in December before Trump’s inauguration. The FBI has looked at Flynn’s conversations with Russian officials previously. In January, they reported that nothing illicit was found in any of those conversations. 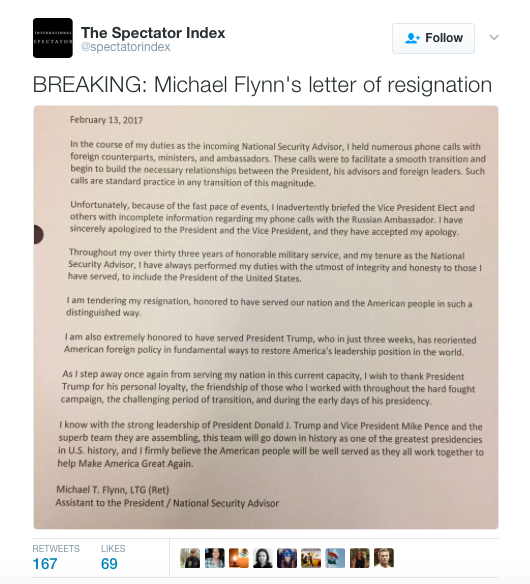 We have a copy of the letter that Flynn wrote up as his resignation. In it, he states exactly why he is stepping down. For now, the White House has named Lt. General Joseph Keith Kellogg to stand as Acting National Security Adviser. Whether for good or bad, these times are definitely exciting times. This is quite the shake-up, the liberal media will be in a frenzy to sink their teeth into anything they can land them on. Keep your heads-up. We are conservatives. As such, when we choose wrong, or make mistakes, we own it, just as Flynn has. His apology has been accepted by President Trump and Vice President Pence, and we need to keep putting one foot in front of the other and not get caught up in the drama of it all if we really want to make America great again in the next 4 years. Don’t let the left break you and force you to engage with their dignity sucking antics. We have good leaders in D.C. now, they will do right by us. Press forward. Besides…the left can point fingers all they want and twist a mistake into a deadly sin. They still tried to make Hillary Clinton president…. The one deadly sin to rule them all.